Bring a contemporary addition to your living room with this reclining sofa. This sofa features deep seating comfort perfect for three. Contrast stitching highlights the detail found in the large scale design. The double pillow back gives a luxurious look that compliments the layered pad arm. Dual reclining mechanism allows for maximum relaxation in your home. 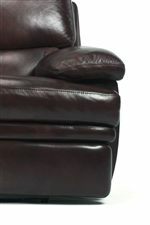 The Latitudes - Dylan Leather Reclining Sofa by Flexsteel at AHFA in the area. Product availability may vary. Contact us for the most current availability on this product.